Would you like to try a research tool that has the ability to clarify your findings and make connections? Creating a table might be just the key to wrapping your brain around a difficult research problem. I use tables in every research project. 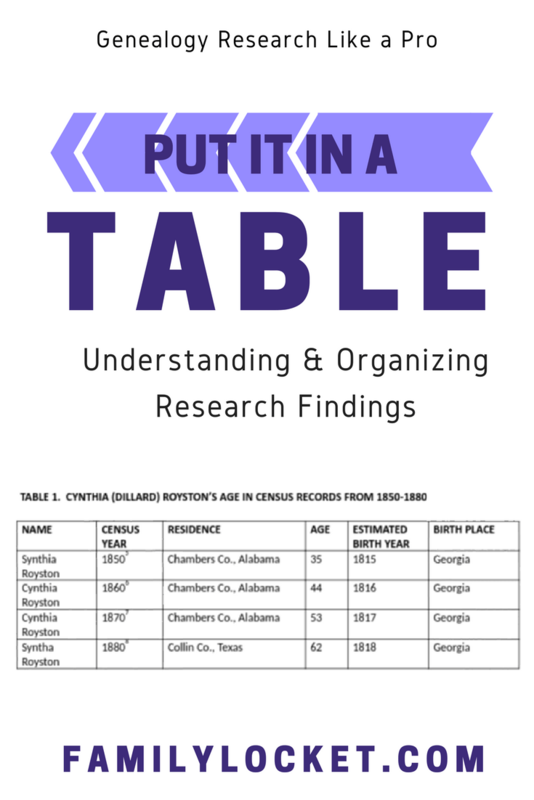 Evidence analysis, census enumerations, and other records take shape when put into a table. Organizing the data by individual, date, and place can make all of the difference in understanding the information. I’ve been researching George W. Dillard, born 1781 in Virginia and died 1854 in Alabama. He is the prime suspect for the father of my Cynthia (Dillard) Royston born 1815 in Georgia and died 1882 in Texas. For the last Research Like a Pro study group, I decided to revisit this possible connection for my research project. In writing up the research I used several tables to help me make connections and explain the evidence. If you have a tricky research problem, this technique can help you look at your findings with new eyes. Let’s take a look at three different types of tables I used to make important connections in my project. I created a table to prove an estimated birth year for Cynthia of 1815 based on her reported age in the census records from 1850-1880. Because none of the census years agree, I settled on the earliest listing, usually more accurate than those later in life. When recording information, always use the spelling of names on the record. Notice the three variations of “Cynthia” used in the census listings. 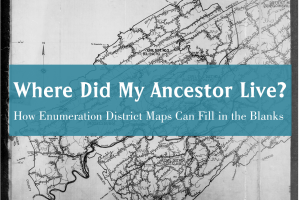 Census templates make it easy to chart a census – especially pre-1850 censuses. Looking at those tick marks from year to year can give clues to the family make-up you might have missed. 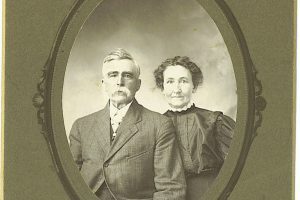 Price Genealogy provides abstract tables for every United States and British census year. Simply download and save the document, then when you’re writing up your research it’s a simple matter to copy and paste the appropriate census into your notes and fill in the blanks. George W. Dillard is a good candidate for the father of Cynthia (Dillard) Royston because his households in 1820 and in 1830 contain a female of appropriate age, born about 1815 (bolded in the tables below). His household in 1830 also contained 12 males ages 20 to 40. I was puzzled by this until I made a connection while writing my research report. Newspaper research revealed that in 1828 George ran an establishment in Columbus, Georgia, for men involved in the land sales. The extra males in the household were probably boarders. Analyzing the two census years side by side also showed that the older female of each census was noticeably different in age. This led me to discover a second marriage between 1820 and 1830. Quite often in a complicated research problem, I’m faced with a lot of facts that need sorting out. A table is the perfect place to make sense of tax or land records. 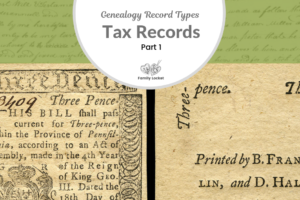 Land records may seem intimidating, but just putting the information into a table makes it approachable. My Dillard / Royston project centered on the land. 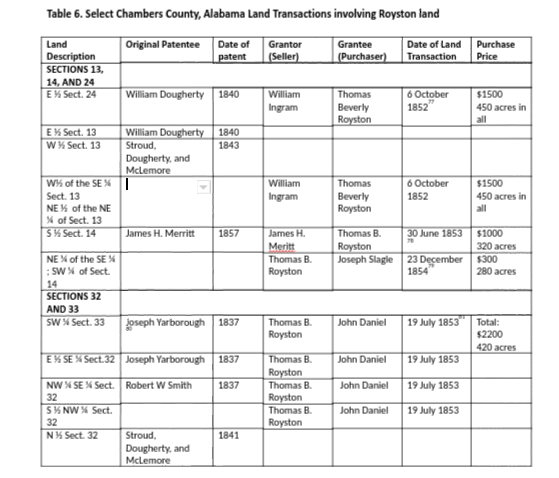 I had hoped that I would discover a land transaction of George Dillard selling land to Cynthia (Dillard) Royston’s husband, Thomas B. Royston, providing a good connection between the two families. Creating a table of the land revealed that there was no connection. This doesn’t disprove George W. Dillard as a candidate for the father of Cynthia (Dillard) Royston, it simply lets me know that I must follow a different research path. Although this is an unusually complicated table, it is much clearer than the various entries in my research log, and serves its purpose in clarifying the many land transactions. How do you create your table? Any word processing program like Microsoft Word or Google Docs has a table feature. Under the “Insert” tab, select “table” then choose the number of columns and rows. By right clicking in any of the cells, you can add to your table or delete from it. Add color to add some style to your table. Experiment until you learn your software of choice. What do you do with your table once it’s created? You could add the table to your database in the notes section or write a simple report about your research findings using the table to illustrate. File the document in your ancestor’s digital folder for future reference. You could also upload it to your online tree to help other researchers understand your findings. Try creating a table. I guarantee you’ll like it.